The Union Govt has given in to the regionalistic TRS's (Telangana Rashtra Samithi) stormy tactics for the bisection of Andhra Pradesh to form a new state: Telangana. 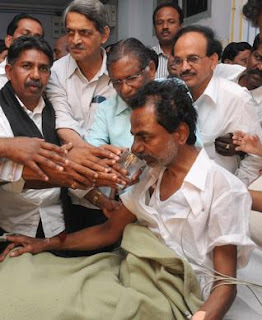 Though the leader of TRS Mr. K. Chandrasekhar Rao is acclaimed to have followed the Gandhian method of agitation there was nothing much "Gandhianism" to be seen on the streets, the way his supporters and students rioted on the streets of Hyderabad. The Telangana Resolution will be initiated in the State Assembly, which if successful, will lead to the formation of the 29th State of India, and hopefully also the 8th Union Territory. Now this Telengana movement did have a long history, but was in the freezer for a long period of time and it was the "keep-on-charming" tactics of the succeeding Central Govts that led to the worsening of the situation and the resultant cave-in. An even-handed Constitutional process has been transmuted into a turbulent tumult, which in the end leaves a very bad taste in the mouth. There are fears that what had transpired with Telangana may be an archetype for other partisan advocates in India. Oh, we have more than enough in our country, haven't we? There are subdues demands for new states for Suarashtra (Gujarat), Vidharbha (Maharashtra), Gorkhaland (West Bengal), Bundelkhand (UP & MP) and numerous others, and the Home Ministry has set a very bad example. Lest not we forget the local-extremist outfits like MNS and Shiv Sena who can now tear Mumbai apart, demanding for its special status and then kick out the non-Marathis out of the nation's financial capital. 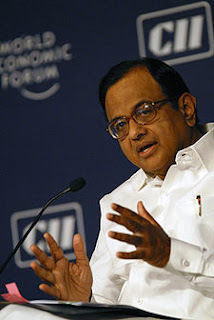 Oh Chidambaram! You, surely could've done this in a far better way. The country is fragmented yet again, first on the basis of language and now on the basis of slang!!! Well, tomorrow some crack politician could revolt for Malabar State as it has a dialect of Malayalam different from the rest of Kerala, it is under-developed because of the intrusion of the South, and there may be takers for all this crap. It will never happen in Kerala but it's almost the same case, only that Telangana has some history behind it. TRS Chief has a headload of rosy dreams for his new state. Of course he owns it now... He and his son, K.T. Rama Rao MLA are head-supremos and demi-Gods for people speaking Telungu, but in a different tone. He argues that the forced marriage with Andhra after Independence is the core reason why Telangana remained backward and that most of the resources from Telangana were used up to develop the other 2 regions of the state, the Coastal Andhra and Rayalaseema. He conveniently forgets that Hyderabad city, the 6000bhp engine of the Andhra Economy is politically within Telangana and is the main reason why the previous 2 Chief Ministers could foster development to a much broader region. K.T. Rama Rao goes a crucial step forward claiming that "there would be no Telangana without Hyderabad." This has put the city back on a revolving pivot again after it entered the Indian Union under volatile and unique circumstances post-independence. Hyderabad owes its progress to the former CM Chandrababu Naidu, ironically from Rayalaseema, who propelled the city from an undistinguished Indian town to a throbbing IT destination renowned the world-over. Thousands of crores were pumped into the city to develop its infrastructure and naturally the city took giant strides. It is now the 6th largest city of India, bestowed with the Metro status and home to over 4 million people. Hyderabad's growth came at a price, the dissent of the peasant community in rural Andhra who were unhappy about their drought-affected, dried up farms when their capital city parks & road-dividers grew greener. The succeeding CM Dr. Y. Rajashekhara Reddy managed to realign this urban-rural balance while funding development, without neglecting Hyderabad. And now Chandrasekhar Rao and TRS is looking forward to milking the city to its limits which was built at the expense of the whole Andhra-ites. Let me tell you, there wont be one soul outside Telangana happy to let go their Capital, which the whole state gave their sweat and blood to build. This could well be another thorn in the flesh for the Union Govt, bestowing a Union Territory status to the Metropolis is said to be an acceptable option. At least until the divided Andhra builds their new Capital, but that'll burn another 10k crores, minimum. Good in a way... India needs more planned cities. Perhaps this could be an opportunity to follow the Chinese model and create novel urban centers. KCR squawks that Telangana and Hyderabad have been spoiled by the "intrusion of Andhra folks" and he would now toil for the development of the whole Telangana region. He talks about irrigation projects, utilizing the Krishna/ Godavari headlands, electrification and associated developments, but is a new state quintessential for all these developments? True, smaller states are better for governance and for pooling investment but being an arid landlocked region how KCR plans to realize his dreams is anybody's guess. Obviously, Hyderabad becomes crucial here. But KCR and Telangana is a case study of how a stock politician, a ploy exploiting regional sentiments and a misguided guile-play by the Center could adversely affect the nation. In a sense, politics is diplomacy but something much more sinister than the latter. Congress has been toying with TRS and their leaders and this one has backfired badly. Worryingly, this could be a precedent for similar separatist movements in the future. I wonder who is now licking their lips, hope its not the Thackareys. The story of the tormented is the same all throughout the world. Indian Homemaker has something to tell about the most unfortunate human beings of our times. Read about it here.